There is certainly a lot to cover when it comes to the rich 175-year history of John Deere. Aside from the obvious advancements to machinery and product lines, a lot of interesting things have happened to shape the company into what it is today. We are going to dig deeper and explore some details about the company that are not as well known. Check out these 10 John Deere facts and see which ones surprise you the most. Over the course of nearly two centuries, a lot has changed; new technologies have been invented, societal needs have transitioned, and the face of the agriculture industry has evolved. During every day of these passing years, John Deere has made strides to keep pace with the changing times and, today, the company continues to provide top of the line equipment. 1. John Deere designed his first plow for Midwestern farmers as a 33-year old blacksmith. 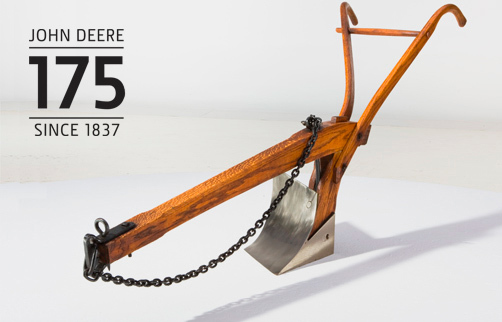 The polished-steel plow became popular due to its ability to cut through sticky prairie soil and resulted in a demand for Deere to build more over the next five years. 2. John Deere only managed John Deere and Company officially from 1852-1858. Deere’s 21-year-old son, Charles, took over as manager in 1858 when economic panic struck the United States and he continued to run the company for the next 49 years, 43 years longer than his father. 3. A bicycle craze swept the nation in 1894, causing the Deere Company to jump at the opportunity. For the next few years, the Deere Leader, the Deere Roadster, and the Moline Special were manufactured but production stopped when the fad lost steam. 4. John Deere and Company went international in 1912, beginning with a manufacturing entity in Canada. Starting in 1956, the company decided to build plants in Mexico, Germany, and Spain. Over the next few years, France, Argentina, and South Africa were thrown into the mix. There are now 104 John Deere locations across the globe—43 in the U.S. alone. 5. Almost 700 tractor models have been designed since 1837. Since John Deere manufactured his very first plow in 1837, approximately 690 different tractor models have been designed, produced, and sold. This number includes 38 backhoe-loader tractors, 45 industrial tractors, 8 Waterloo Boy tractors, and 70 Lanz farm tractors. Woah! 6. As of 2010, John Deere and Company employed more than 56,000 employees worldwide. With multiple departments to choose from, there are ample opportunities to work at John Deere—even if you’re not an expert tractor engineer. 7. The Industrial Equipment Division of John Deere was officially established in 1958. Although this division became official in the 50s, the company had been doing business in that industry for decades. The Deere factory in Dubuque, Iowa rolled out the first industrial-yellow crawler tractors designed specifically for industrial applications. 8. There have been eight variations of the official John Deere trademark logo. In fact, the leaping deer design was altered several times before arriving at the modern green and yellow image. 9. The company hit a historical financial landmark in 1998 by reaching $1 billion in profit. This was a first not only for John Deere but for the entire agricultural equipment industry. It now produces equipment for multiple industries, including agriculture, residential, golf and sport, commercial construction, forestry, government and military, and landscaping. Of the many fascinating things there are to know about John Deere and Company, we found these to be the most noteworthy. Can you think of any other John Deere facts, information, or little-known details that could be added to this list? If so, we would love to hear from you in the comments below.